Mafell as a brand is more skewed towards joinery rather than cabinetwork and this big router reflects that to some degree. 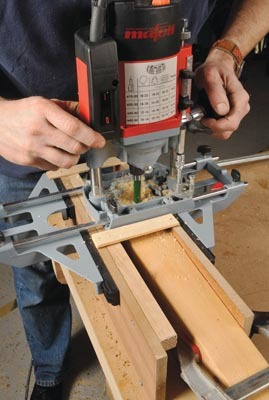 While it is sophisticated, it is intended for freehand not table routing. It does have much to offer, however, if you work overhand with jigs and templates. The Digital-Electronic system means that if the switch is put in the on position when plugging into the socket, unintentional starting of the motor will be avoided. A restart takes place only when pressing the switch again, making the machine unsuitable for use in a table with an NVR switch linked in. It has a constant operating speed (speed control from 10,000 to 22,000 l/min) as well as brake function for stopping in a matter of seconds. There is height adjustment on the guide column with a fine thread and also improved clamping and column guidance due to a longer seated roller bearing in the column casing when plunging. Certainly it plunges and locks smoothly and reliably. The base facing is screwed on instead of glued and it has four additional threaded holes in the baseplate for simple use of template guide systems. The biggest omission is any form of fine height adjuster. To fit a guidebush you need first to cut the phenolic resin base facing to remove the centre portion. A bonus is being able to invert the LO65EC on the flat top casing when installing cutters or collet changing. It is big and powerful but not daunting to use and pretty much stays put at startup rather than kicking away. I used it for morticing using a mortice box and a second fence for guidance and it worked really well. Guidebush centring is accurate too. The lack of provision for table working did not stop me trying and by bolting it under a homemade table and making up a fine adjuster with a small box spanner and tommy bar attached in place of the nut on the threaded height lock rod, I managed to use it properly in inverted mode. This nice machine was fun to use and, despite the manufacturer’s intentions, it adapted successfully to table mode. It has plenty of power, is not unduly noisy and is well built.